In a recent visit to the Smithsonian Museum of American History, I saw a small exhibit about the first cake mix in America. Charlotte Cramer Sachs developed boxed mixed for cakes, puddings, frostings, breads, muffins and popovers starting in 1948. You only needed to add water. Eggs and milk were included in the mixes. According to the package, “Since there’s so much less to add, it saves you money.” I doubt she could get away with a claim like that today. My brother said that today’s mixes don’t include eggs because people didn’t feel they were baking unless they added something besides water. 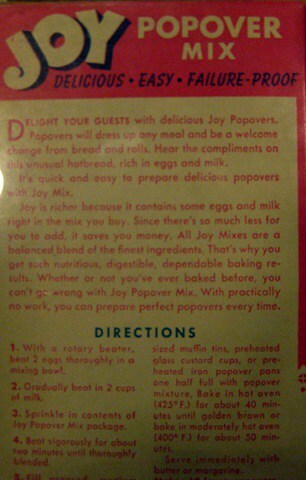 The exhibit showed a letter and survey that Sachs sent to potential customers along with samples of the popover mix. Then, as now, it seems that surveys were recognized as selling tools as well as a way to improve products. Sacks clearly hoped that the recipient of her letter would help promote her products. The respondent loved the mix and raved about how easy it was. Unfortunately, the cake mix box didn’t have a list of ingredients. We take ingredient lists for granted, but it wasn’t a requirement until the 1960s. So do you thing that cake mixes were a a worthwhile invention? If Sachs hadn’t done it, surely someone else would have.